This was me. Okay, no, it wasn't me, but it might as well have been. I was there throughout the night, often completely alone in the dark and silent Church, with the Host enshrined in its golden monstrance glinting on the altar. And as it opened, He entered into it and filled me with His healing presence. I realised that all of my pain, bitterness and despair had completely gone and that my heart was filled only with peace and joy and love. The tender presence of Christ permeated my whole being; so gently that it was almost without me realising; my heart burned with love. I looked back over the painful events that had happened over the past couple of years, which before had given me physical pain in my stomach to think about; but now there was no pain, no hate, no anger, only love, overflowing, unbounded, unstoppable! Christ was in me! He dwelt within me, in the flesh, bringing me into life, into true life. Christ was in the Eucharist! I could see His body up on that altar in the consecrated host; He was before me, in the flesh. I physically met Him! My Lord, my friend, my teacher, my Saviour and my God! He was right there in front of me, I saw Him with the eyes of my heart, transforming my broken sight which before had found no meaning in a hard and cruel world...but now saw the reality before me entrenched in Divine meaning, God’s beautiful creation unfolding before my eyes, and everything pointing towards Him, the Son of God, in the flesh. He transformed my broken heart of stone into a beating joyous heart of flesh. I'm still wiping my tears from reading this. This was me. Maybe not in the details, but I shared the despair, the pain, the feeling of being completely alone. And like Carly, I met Jesus in the Eucharist. It is true. 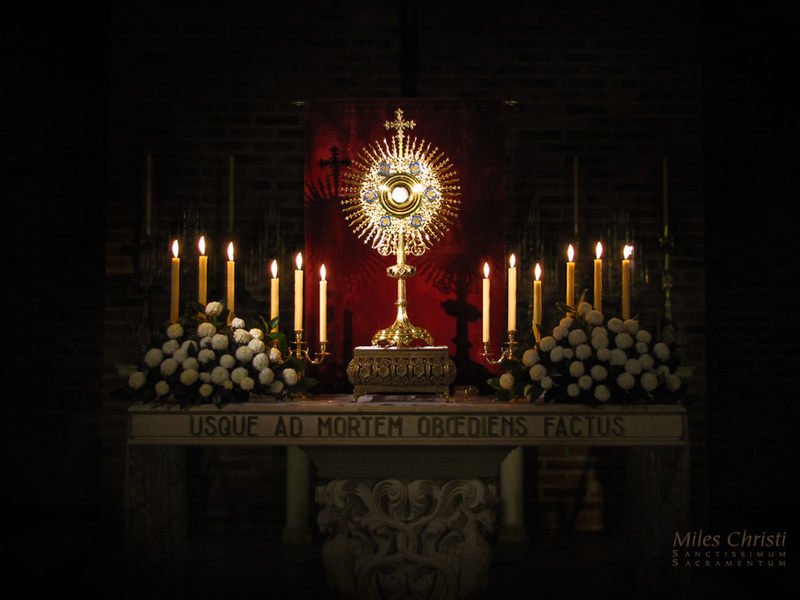 Jesus is truly present in the Eucharist, and He is waiting for us to come to Him with all of our despair, pain, sin and emptiness so that He can fill us with His love. Don't you have a deep, deep longing for love? A longing so deep that nothing and no one else can fill it? Go to Jesus. Not in an abstract kind of way, but in the most REAL way possible. In the Eucharist, Jesus is present before you in a way that is just as real as if your friend Julie were in front of you. It is an earth-shattering, life-changing truth.